If someone tells you that they spend a lot of time and effort travelling around the world photographing slugs then you might think them rather odd, but for many scuba divers the pursuit of sea slugs (otherwise known as nudibranchs) has become a passion. There are over 3000 types of nudibranch, living everywhere from Antarctica to the tropics, so there's plenty to keep the divers happy. This Nembrotha cristata looks more like a terrestrial slug than any of the other sea slugs I saw during two weeks in the Philippine Islands, though there aren't many terrestrial slugs which boast its bold colors and patterns. Bold colors and patterns are par for the course as far as nudibranchs are concerned, and it's the reason why people become so enamored with them. 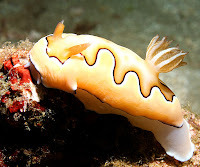 Also par for the course are Latin names - this species is known to its friends as Chromodoris magnifica, with no prizes given to anyone who can guess what "magnifica" means in English! It might seem that this individual is leaning forward to sniff the thing growing in front of it, but in fact nudibranchs don't rate too highly in the intelligence stakes, and it's usually a mistake to credit them with thinking or even basic smarts beyond crawling around, eating and avoiding pain. Chromodoris annae (Anna's chromodoris) seems to have a particular liking for the leathery sponge that I found this individual on, because most of the photos I've seen of this species show it on the same background. Apparently they can reach about 5 centimeters in length, but I think this one was a little smaller. Weirdest animals and creatures in the world.